The positive vibes of thousands of youngsters learning about a higher purpose filled the massive auditorium. Adults play many roles and make countless decisions throughout the day while dealing with ever-changing circumstances and uncertainties. Work, bills, health, social commitments—adulthood is complex and rarely perfect, and it poses an interesting question: What does it take to shape generations of young people into thriving members of society, both now and in the future? 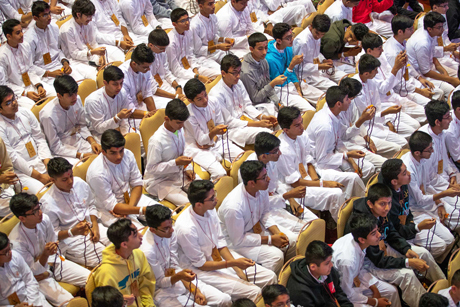 Over the last five years, the youth of BAPS Swaminarayan Sanstha surveyed children for personal perspectives to better understand difficulties in decision-making. Guided by this data, the theme of the 2018 North American Youth Convention was developed as Moksha (ultimate liberation). (Left) The devotion was palpable. The concept of Moksha can seem irrelevant to youths, given the notion of invincibility associated with being young. However, the idea was presented throughout the convention in a practical and contemporary manner; the focus was on the importance of purpose, sincere effort, perseverance, prayer, and introspection as core components of character. 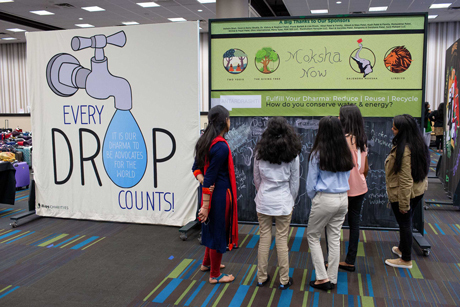 Over 10,000 children and youth between the ages of 8 to 22 were split into three groups and participated in three-day programs from July 1 to 10 at the Hyatt Regency Hotel in downtown Atlanta, Georgia. The 10-day event, unprecedented in the history of Hindus in North America, was built around Moksha as life’s greatest pursuit that generates unwavering happiness to be experienced here and now. 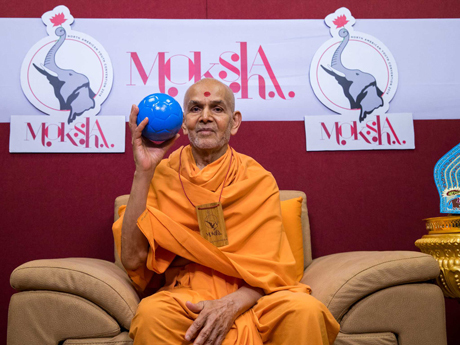 Delegates learned that the means to achieve Moksha could also allow them to enjoy the world, especially when every activity undertaken focuses on keeping God and the Guru in mind. Dharma (roles and responsibilities), artha (worldly pursuits), and kaam (desires) were explained. (Left) Mahant Swami Maharaj addressing the youngsters. Two senior swamis from India and many other swamis from across North America simplified how to make Moksha-centered decisions in daily life. They explained that living life with the goal to attain moksha leads to an elevated experience and an optimistic perspective. In a stage program, the challenges of several characters were portrayed as they navigated everyday scenarios that brought out dilemmas of desires versus values. Instead of looking for instant gratification, the young adults were asked to contemplate perspectives that could lead to a higher way of life. Making good choices lies in a balance between confidence and humility. Attendees took home a message of how to be less concerned about what others think of them, and more concerned about what they think of themselves. Sejal Maisuria, a volunteer from Canada, commented, “Coming to conventions like this, it broadens your horizons; you see so many people having dealt with so many issues such as peer pressure, that it gives our delegates the tools and the know-how to deal with the same situations when they go home." The convention helped nurture virtues and helped youth build a healthy identity anchored in deep roots. Documentary of the Bal-Balika BAPS North American Youth Convention organized in Atlanta, GA.
Kishore - Kishori BAPS North American Youth Convention 2018. Kishore-Kishori Documentary - BAPS North American Youth Convention 2018.